NOTE: This article really needs you to have looked at the preceding HEART OF THE SUN Graphics.. this 1st plz..
Certain ironies here, Richard Courtier writes Sirius B ratio to our Sun's mass is ratio Great Pyramid mean edge to Kephren, IF the correction factor of .0136 Comma of Pythagoras is used. This is the correction which changes the fifth in music from perfect fifth (1.5 fit) to "equal temperment". If you use pure fifth's, then your tuning prevents you from changing "keys", keeps you incubating. Forcing you to experience serparateness, possibly producing the agony of separateness deeply enough to incubate the birth of new compassion (which ultimately will by the turning inside out of gravity making implosion resulting in the ekg, eventually to bend stars.) If on the other hand you temper your octave so that each interval is the 12th root of two, then all key signatures have the same ratio, and you get the feeling of being able to switch scales without changing ratio. What you sacrifice on that cross of frequencies, is that then all your notes are not quite in tune.. More irony in that it is the SEVENTH power of the 12th root of two, which produces the FIFTH (almost 1.5 times the base note..), for example although your A is 440, then the fifth above "should" be 660 to fit pretty in the ear, in fact moving up seven half steps to this fifth, each is 12th root of two, the seventh time you arrive is .0136 less than 660 hz. 4. The Ophanim Sigil of Truth (Center of Temple of Solomon).. 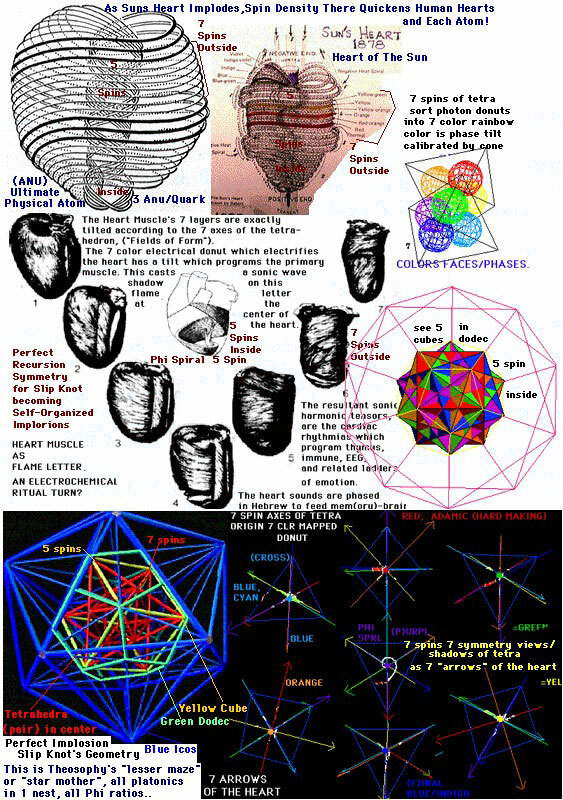 The Geometry of the Heart of the Sun and the Electron.. When I first wrote that web article which discusses the symmetry of the heart of the sun in comparison to the occult chemistry and later quark physics.. It was because dear friend Dale Mullins, needed help for his hi draco friend (whom I later played with...) who was Q (Max) from Hiwaii.. he was having trouble sorting the interventionist vs non-interventionist intentions of the ET''s from Sirius A versus Sirius B. I had helped them communicate with the Andromedan's who answered (via Alex Collier): Focus shamanically into the "heart of the sun" and that will do the sorting needed to get lo grade DNA..ET's out of your aura. When Max rang back to say, yes that worked very well, I got so curious as to what made the Heart of the Sun so good at sorting which shaman could get thru, that I did the analysis which is that web article. The upstart is that Sirius B turned out to be the interventionist (Borg), disrespect for individuation/individual "degrees of freedom". Richard Courier is discussing the 136 degrees of freedom of the electron. What the chemist means by degress of freedom is the number of variables you set free becomes proportional to the amount of new order (learning?) which is possible from the reaction. In psychological terms this is equivalent to noting that you cannot learn much from the characters in your dream unless you set them free (God's reason for doing that with us..). Unlike Siruis B, Our SUN had the chutzpah to spit total incubating magnetics to our DNA (center of MAYAN calendar=solar magnetics grid=DNA codon hexagrams). And in political practice this means that altho the Andromedan council pretends to humor those Orion interventionists including Sirius B who said that our solar system has been their spoil of war (Ea & An) too long for any "FREEDOM FIGHTER" meddling, the upstart is those genepools incubating around well tempered suns still playing the interventionist game here will be toast when our sun IMPLODES anyway! (Shape shifting our senators soon will end .) The Draco leaders of the interventionist discover that if they destabilize our gravity grid (from fractal participation in solar implosion), THEIR whole galactic sector gets no navigator in the biggest wormhole (PESHMEHEN = "Nexus"= "DEEP SPACE NINE") Their old lose the atmosphere "oxygen wars" (Total Recall), martian technique is getting stale here in the bleeding air of earth. I'll O X Y their genes. Orion connection to argo naut, argo navis see phaistos disk.. Consider Pure Geometric Derivation of the Fine Structure Constant .137 from Translation of Vorticity on Surface of Toroid in Hydrodynamics..